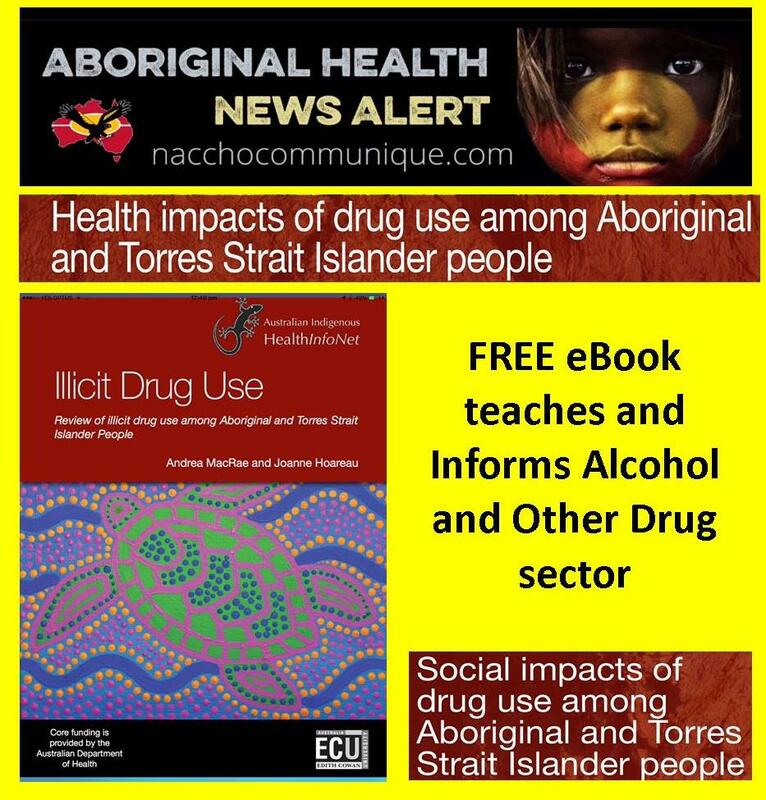 The Australian Indigenous Alcohol and Other Drugs Knowledge Centre (AODKC) this week launched a new eBook about illicit drug use. The interactive electronic version is a powerful learning tool and is based on the 2016 Review of illicit drug use among Aboriginal and Torres Strait Islander people. HealthInfoNet Director, Professor Neil Drew says ‘This is our second eBook as we continue to expand our suite of digital tools and new platforms to deliver knowledge and information to the sector. The eBook has been created for Apple devices such as iPads, iPhones, laptops and desktop computers. Users can read it, listen to it, make notes and copy/paste content. Embedded in the eBook are short films and links to the original source of references. Once downloaded, the eBook can be accessed and used multiple times in any way that the user determines. In addition, you can also access from the AODKC site, a short an animated infographic of the eBook which provides another learning opportunity. Illicit drug use is an issue of concern to Aboriginal and Torres Strait Islander and non-Indigenous Australians. The purpose of the review is to provide a comprehensive synthesis of key information for people involved in Aboriginal and Torres Strait Islander health in Australia. The eBook is the review in another dynamic format. The National Aboriginal and Torres Strait Islander Peoples Drug Strategy 2014-2019 (NATSIPDS) is a sub-strategy of the National Drug Strategy 2010-2015 (NDS). The NDS aims to build safe and healthy communities by minimising alcohol, tobacco and other drug related health, social and economic harms among individuals, families and communities. The overarching goal of the NATSIPDS is to improve the health and wellbeing of Aboriginal and Torres Strait Islander people by preventing and reducing the harmful effects of alcohol and other drugs (AOD) on individuals, families, and their communities. 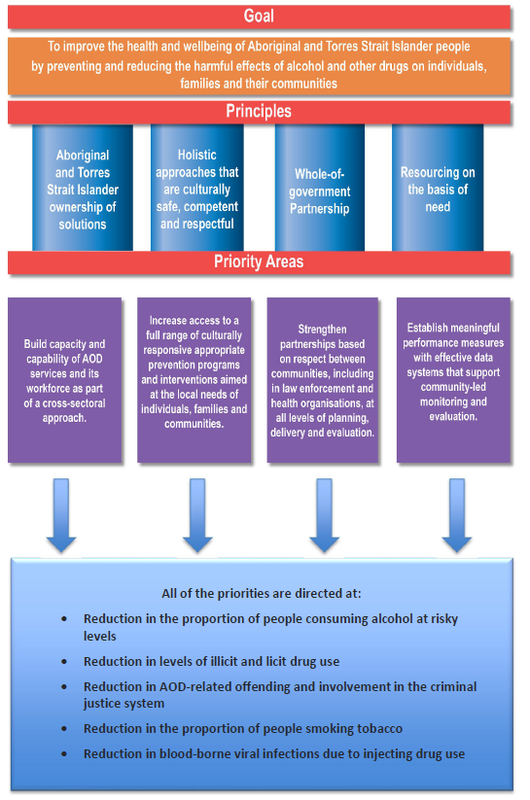 More information: The Knowledge Centre provides online access to a comprehensive collection of relevant, evidence-based, current and culturally appropriate alcohol and other drug (AOD) knowledge-support and decision-support materials and information that can be used in the prevention, identification and management of alcohol and other drug use in the Aboriginal and Torres Strait Islander population.